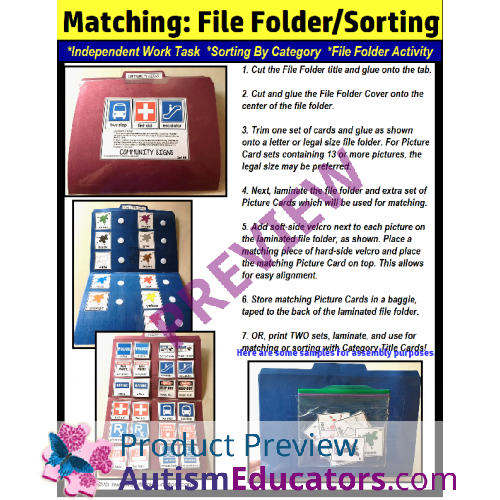 FREE File Folder Activities For Special Education: MOTHERS DAY for matching, sorting, and assessment! 1. Given a picture related to a holiday (Mother’s Day), STUDENT will state who or what is seen and select the identical matching card, with 80% accuracy, in 4 out of 5 opportunities, by MONTH, YEAR. 2. 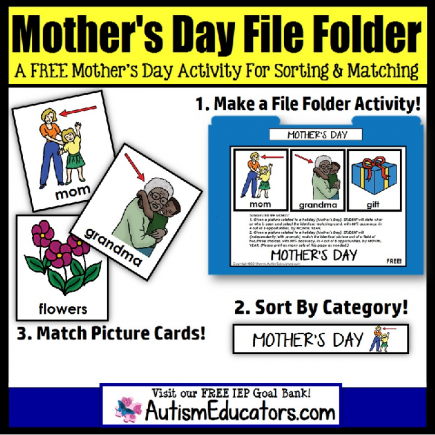 Given a picture related to a holiday (Mother’s Day), STUDENT will (independently/with prompts) sort and match the identical picture our of a field of two/three choices, with 80% accuracy, in 4 out of 5 opportunities, by MONTH, YEAR. HOW CAN I USE THIS ACTIVITY WITH MY STUDENTS? 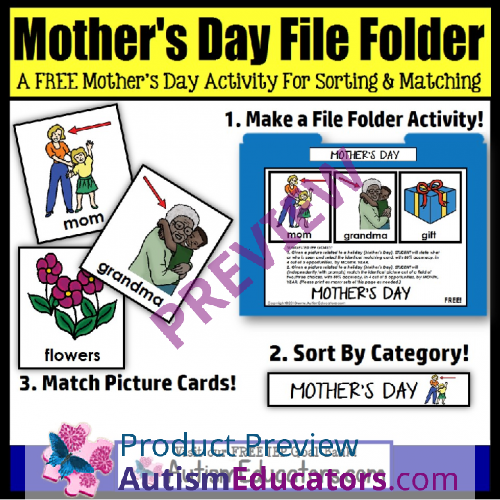 • Print two copies of the Mother’s Day cards and create a File Folder Activity. Use during independent work task time, or even as one-on-one for daily review, or initial/mid-year/final assessment. 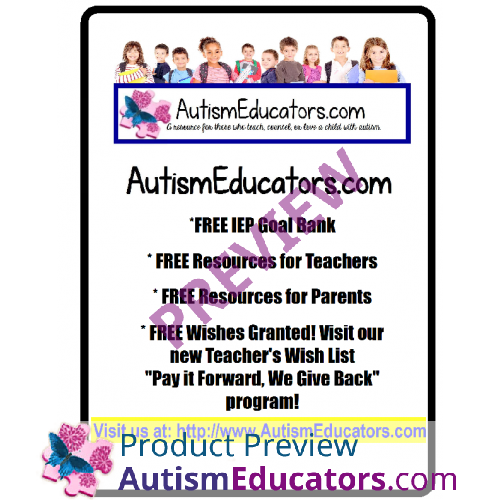 CAN I REQUEST A TOPIC THAT MY STUDENTS ARE WORKING ON IN CLASS, OR TOWARDS AN IEP GOAL? • Absolutely! Please feel welcome to email me at DSinger@AutismEducators.com and tell me about what your student is learning, an IEP Goal he/she is striving to achieve, or just a preferred topic. I will get back to you within 24 hours. • I LOVE reading and responding to your feedback! Your kind words inspire me and I DO read ALL feedback that each product receives. © Copyright 2018 Autism Educators, Inc. (AutismEducators.com). All rights reserved by author. This product is to be used by the original purchaser only. Copying for more than one teacher or classroom, or for an entire department, school, or school system is prohibited. This product may not be distributed or displayed digitally for public view, uploaded to school or district websites, distributed via email, or submitted to file sharing sites such as Amazon Inspire. Failure to comply is a copyright infringement and a violation of the Digital Millennium Copyright Act (DMCA). Intended for single classroom and personal use only. Given a picture related to a holiday (Mother’s Day), STUDENT will state who or what is seen and select the identical matching card, with 80% accuracy, in 4 out of 5 opportunities, by MONTH, YEAR.